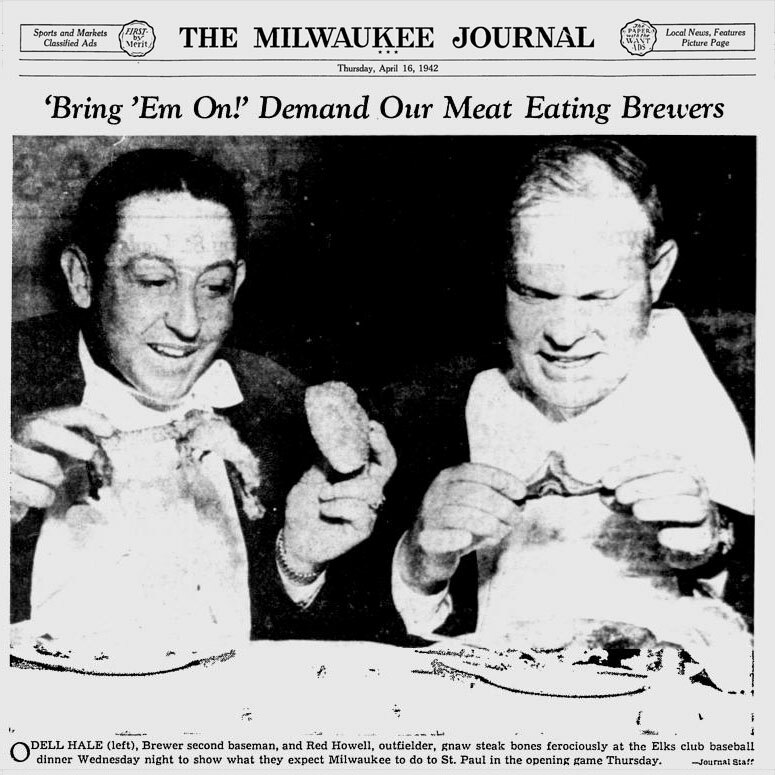 Borchert Field: "Our Meat Eating Brewers"
Although taken in the springtime, this photo seems appropriate for Thanksgiving Day; on the eve of the 1942 baseball season, the Milwaukee Journal's camera caught a pair of brand-new Brewers enjoying the team's annual season-opening celebration at the Elks Club. 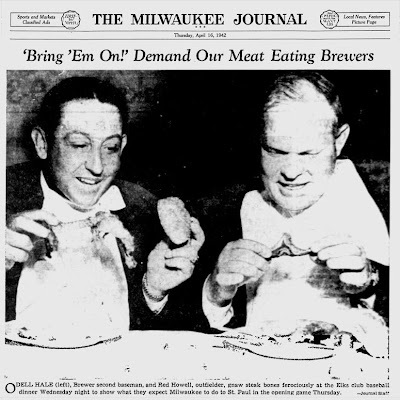 Odell Hale (left), Brewer second baseman, and Red Howell, outfielder, gnaw steak bones ferociously at the Elks club baseball dinner Wednesday night to show what they expect Milwaukee to do to St. Paul in the opening game Thursday. The "baseball dinner" was a traditional event held the night before the home opener; it was at one of these dinners that team president and ballpark namesake Otto Borchert suffered his fatal heart attack in 1927. The 1942 affair was fortunately devoid of such tragedy, and the Brewers appeared ready to start the season. After a nice steak, of course. Second-sacker Odell Hale was a new Brewer who came to Milwaukee from the New York Giants. He had been in the big leagues (with two quick dips into the minors) since 1931. He struggled with injuries in 1942, seeing action in only 60 games. That was enough for the veteran, and after his one season Hale informed the Brews that he was retiring from baseball, preferring to stay on his Arkansas farm. Few players have had a more distinguished minor league career than Howell, who has hit .300 or better in 13 of his 14 professional campaigns and has averaged 93 runs batted in each year during that time. In 1929 and '30, early in his career, he led the Sally league with percentages of .372 and .341, and won the International league crown in 1940 with a mark of .359. Red also pounded in 122 tallies for Baltimore. With a resume like that, it's no wonder that team president Bill Veeck was eager to add him to the Brewer lineup. It must have been doubly disappointing when Howell started accumulating injuries in Spring Training; first a pulled muscle, then a cracked rib. Howell's career at Borchert Field never got started and he returned to the International League, sold to the Jersey City Giants in mid-season having played only one game in a Milwaukee uniform. In that one game, he went 0-for-2 with a walk and a run. Neither of these men would make their mark on Milwaukee baseball, but at that baseball dinner at the Elks in the spring of 1942, all things must have seemed possible. Bill Brenzel, "Handling that Funny Stuff"